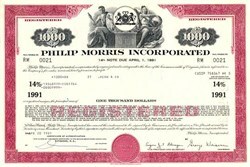 Beautiful certificate from the Phillip Morris Incorporated issued in 1981. This historic document was printed by Security-Columbian Banknote Company and has an ornate border around it with a vignette of an allegorical man and woman with the company logo. This item has the signatures of the Company's Chairman and Secretary and is over 26 years old. Altria Group, Inc. (NYSE: MO) (previously named Philip Morris Companies Inc.), based in New York City, is the parent company of Kraft Foods (as February 2007), Philip Morris International, Philip Morris USA and Philip Morris Capital Corporation. In addition, Altria Group, Inc. has a 28.7% economic and voting interest in SABMiller plc. Altria is one of the world's largest tobacco, food and beverage corporations. It is a component of the Dow Jones Industrial Average and S&P 500. On January 27, 2003, Philip Morris Companies Inc. changed its name to Altria Group, Inc.
On February 1st 2007, the company announced its plan to spin-off Kraft foods (publicly traded since 2001). The stake of the company in the food processing giant will be distributed to its shareholders. 1847: Philip Morris opens a shop in London, selling tobacco and ready-made cigarettes. 1881: Philip Morris goes public in London. 1887: The company becomes Philip Morris & Co., Ltd.
1902: Philip Morris & Co. Ltd. is incorporated in New York. 1919: Acquisition of Philip Morris & Co. in the US by a new firm owned by American stockholders and incorporation in Virginia under the name of Philip Morris & Co., Ltd., Inc.
1954: The first major affiliate outside the USA is created: Philip Morris (Australia) Ltd.
1955: Philip Morris & Co. Ltd., Inc. changes its name to Philip Morris Incorporated. 1955: Philip Morris Overseas is established as an international division within Philip Morris (to be renamed Philip Morris International in 1967). 1963: Philip Morris acquires its first factory in Europe, Switzerland's Fabriques de Tabac R�unies (FTR). 1967: Philip Morris reorganizes to create three internal operating divisions within Philip Morris Incorporated: Philip Morris Domestic, Philip Morris International and Philip Morris Industrial. 1968: Philip Morris Domestic changes its name to Philip Morris USA. 1970: Philip Morris GmBH set up as an affiliate in Germany. 1985: Philip Morris Companies, a holding company, becomes the publicly-held parent of Philip Morris Incorporated. 1987: Philip Morris International, newly incorporated operating company, acquires the international business division of Philip Morris, Inc.
1988: Philip Morris Companies Inc. acquires Kraft Foods. 2000: Philip Morris Companies Inc. merges Nabisco, a spin-off from RJR Nabisco, into Kraft Foods. 2001: Philip Morris International headquarters are relocated from the USA to Lausanne, Switzerland. 2002: Philip Morris Companies Inc. sells Miller Brewing Company to South African Breweries, retaining a 36% share. 2003: Philip Morris Companies Inc. changes its name to Altria Group, Inc., the parent company of Kraft Foods, Philip Morris USA, Philip Morris International and Philip Morris Capital Corporation. 2007: The company announces the spin-off of Kraft Foods, and will concentrate on its tobacco activity.